If you’re on the hunt for a robot vacuum, you are likely familiar with the name Roomba. Roomba robot vacuums come with various features and price points, ranging from the budget-friendly Roomba 690 up to the top-tier Roomba i7+ with its self-emptying dust bin. There are a number of other robot vacuums sweeping the market, but are any of them worth with switch? There are quite a few options if you’re looking for the best Roomba alternatives and this guide is going to highlight some of our favorite models. As a reminder, all robot vacuums are put to the test here at Modern Castle. We evaluate each model based on a number of factors including cleaning performance, usability, quality, maintenance, and more. See our full list of robot reviews here. What’s to like about the Botvac D7? The Neato Botvac D7 Connected is one of the only Roomba alternatives on this list with the ability to create a digital map of your home. Along with the virtual map, you can set up “no go lines” which are digital barriers that help to block off sensitive areas without the need for physical barriers. It has the Recharge & Resume feature as well for ultra-extended run time. What’s not so good on the Botvac D7? Replacement parts seem to be more expensive. In addition, the price tag isn’t cheap. In some cases, it’s just as much or more than the Roomba itself. The Neato Botvac D7 Connected costs about the same as a Roomba, but the advanced navigation, long run time, “no go lines”, and Recharge & Resume capabilities really help the Botvac to stand out from the pack. What’s to like about the Roborock C10? The Roborock C10 had virtually flawless cleaning performance on hardwood floors. It’s priced extremely reasonably, and one of the best budget robot vacuums on the market today. It’s easy to use and wifi-enabled, allowing it to pair with an app on your smartphone for updates about cleaning cycles and automatic notifications. What’s not so good on the Roborock C10? Because the Xiaowa lineup is produced overseas, replacement parts can be more difficult obtain. Overall, the Roborock C10 is an excellent option if you want great cleaning performance at an amazingly low price. It is wifi-enabled, has an advanced cleaning app, and can create a digital map of your home. While finding replacement parts will likely be an issue for any consumer, it has some great features that help to balance out this annoying factor. What’s to like about the Tenergy Otis? The cleaning performance of the Tenergy Otis robot vacuum was excellent (96% on hardwood floor and 99% on low pile carpet). This inexpensive robot vacuum comes with a wireless remote control, has three cleaning modes (Turbo, Edge, Spot) and allows for easily scheduled cleaning cycles. What’s not so good on the Tenergy Otis? Under the hood, it has got a surprisingly short brushroll, which means that it may take more time and more passes to complete a cleaning cycle. There’s also a limited number of edge sensors so it could struggle more with complicated navigation. Tenergy doesn’t have any mapping technology so it won’t be able to remember your home’s exact layout either. We’re calling the Tenergy Otis the “dark horse” in this review because that’s what it is. Tenergy is one of the least known brands in the robot vacuum market, yet it out performed many popular models and was on par with some mid-tier Roomba models. At a fraction of the cost, it’s hard to not look past this small-but-mighty machine. What’s to like about the Deebot N79? The Ecovacs Deebot N79 is priced very reasonably, comes with a wireless remote, and built-in wifi so it can be controlled remotely or even from your smartphone. On hardwoods, the N79 did an excellent job and captured nearly 99% of all debris tested. It has a usable interface and was simple to get up and running. RELATED – read our full Deebot vs. Roomba comparision here. What’s not so good on the Deebot N79? We found getting a replacement battery for this unit to be pretty difficult. On average, it’s likely that you’d need to replace the battery after the first 2-3 years or so (give or take depending on use). Also, in terms of cleaning performance, it did struggle with fine debris (like sugar and kitty litter) when on carpeted floors. The Ecovacs Deebot N79 is a great option if you’re looking for a budget robot vacuum with wifi-connectivity, decent cleaning performance, and a long 100-minute run time. It has three cleaning modes—auto, edge, and spot cleaning. In addition, it has an advanced V-shaped brushroll that is nice for pet hair and helps to prevent tangles. What’s to like about the RoboVac 11? The Eufy RoboVac 11 is extremely easy to use. Similar to the Deebot N79, the Eufy has a one-button control on the top of the vacuum for auto on/off cleaning, wifi connectivity, and includes a wireless remote control. It has two side spinning brushes and six cleaning modes (Auto, Spot, Single Room, Edge, Manual, Max). It also comes with a washable foam filter which can translate to reduced maintenance costs. What’s not so good on the RoboVac 11? The Eufy RoboVac doesn’t have the intelligence to know when it’s done cleaning and will simply keep cleaning until you send it back to the base. If you plan of running cleaning cycles while you’re away, this could be a problem. In addition, it takes 5-6 hours for a full charge so you may need to plan ahead to make sure Eufy is ready to roll. The Eufy RoboVac 11 is a good value, considering its features, overall performance, and long 100-minute run time. It has an average of 90% cleaning performance across all floor types and did especially well on hardwood floors. The Eufy is easy to setup and easy to control. You can even manually direct the robot using the wireless remote control which is a unique feature to Eufy. What makes the Roomba a good robot? Now that you have an idea of how these models compare to Roomba, let’s do a rundown of the Roomba core features. RELATED: Don’t miss our Roomba Reviews page where we go over all the Roomba models in one place. 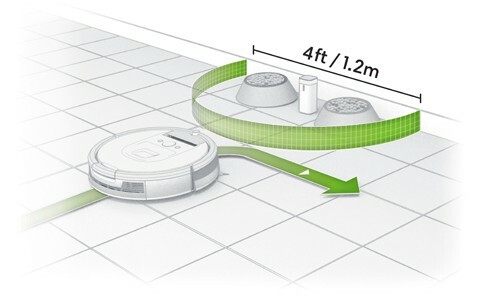 There are a number of different design decisions and features that help the Roomba to perform at the level that it does. Under the hood, all Roombas are pretty similar. They’ve got a central brushroll that can either be bristle (like on the Roomba 690), rubberized dual brushrolls (like on the Roomba 890), or the newest rubberized I Series brushroll (like on the Roomba e5). They also have one side spinning brush that helps to draw dirt and debris away from corners and edges and sweeps in into the path of the central brushroll. There are edge sensors that encircle the edge of the vacuum with a navigational wheel at the helm. Contact sensors on either side of the front wheel helps the Roomba to dock itself back at the charging station when it has completed a cleaning cycle. This feature allows the Roomba to recharge in the middle of a cycle and then return the spot where it last was cleaning. It can repeat this twice, tripling the overall run time of the vacuum. Recharge & Resume is only available on top tier models like the Roomba 960, Roomba 980, Roomba i7, and Roomba i7+ models. While there are still good alternatives to Roombas, not many models have this feature, with one exception being the Neato Botvac D7 Connected. Roombas ranging from entry level to top-tier generally include some degree of virtual barrier technology. Budget robot vacuums like the Roomba 690 includes 1 virtual barrier while advanced models designed for larger homes, like the Roomba 980 includes 2 virtual barriers. The current Roomba virtual barrier uses infrared light to block off straight paths (up to 10’ long) or radial areas (up to 4’ in diameter). Roombas have varying levels of advanced navigation from “bump and continue” approaches like the Roomba 690, memory mapping like on the Roomba 890, and even on-board camera like on the Roomba 980 and Roomba i7 vacuums. The models with iAdapt 2.0 and later have the ability to navigate in straighter paths and more logical patterns. Of course, competitive alternates to the Roomba lineup will have varying degrees of advanced navigation. For example, the Tenergy Otis, the Roborock Xiaowa Lite, and the Eufy RoboVac all have a sensor at the front of the vacuum. Aside from Roombas’ aesthetics and fancy bells-and-whistles, it’s hard to look past sheer cleaning performance. As mentioned above, our cleaning performance test is a large portion of how these robot vacuums score. And Roomba name or not, all of the vacuums featured here are put to the test to see how they perform against general household messes. Our cleaning performance test is done in-house on three different flooring types (hardwoods, low pile carpet, and high pile carpet) and with four different debris types (cereal, kitty litter, rice, and sugar). To date, we’ve tested over 21 (and counting) robot vacuums and Roomba models round out the top 5 models. What Are the Best Roomba Alternatives? So we’ve walked through some of the top features that make Roombas notable in the robot vacuum market, and highlighted a few models that have similar features. But are there other models that round out the whole package as a real contender against Roomba? The Xiaowa recognizes floor types and obstacles and controls its speed accordingly. While Roombas are excellent robot vacuum cleaners, one thing can get in the way of bringing one home. Sure you can get a budget Roomba, like the wifi-enabled Roomba 675, but most Roomba models are going to be $300-$500 bucks, with the high end models being $700-$1,000. RELATED: Check out our guide for the best cheap robot vacuums. As you can see, there a few top models that can actively compete with the features and cleaning performance of the Roomba lineup, at a fraction of the cost. If you’re looking to save some cash, but don’t want to shell out the cash for a name brand Roomba, you may be in luck. Before you go, here’s a quick list of when you may want to go with Roomba and when you could go with a Roomba alternative. Easy part replacements: Roombas are US-based and widespread in the US, making it quick and easy to find replacement parts as needed. Great cleaning performance: Roomba models make up our top 5 performing robot vacuums that we’ve tested to date. They’re expensive, but if you’re serious about great cleaning performance, it’s hard to beat that of a Roomba. Want a self-emptying robot vacuum: While we didn’t touch on the model here, Roomba recently launched the first robot vacuum we’ve tested with a self-emptying dust bin. Say hello to the Roomba i7+. If you want top-of-the-line convenience and navigation, this model has you covered. Advanced virtual barriers: The Neato Botvac D7 Connected offers digital “no go lines” that can be drawn with your finger on the app to virtually communicate with your robot vacuum. No cords, no physical barrier, no go. A bargain vacuum: If you’re looking to snag a deal on a cheap robot vacuum, there are some great non-Roomba alternatives that offer solid cleaning performance and basic features, without the high price tag. A remote control: Roombas do not come with a remote control, mainly because they include smartphone apps. But if you like the feel of a physical remote control, the Tenergy Otis, Ecovacs Deebot N79, and Eufy RoboVac 11 all come with a remote control. The Eufy even allows you to use the remote control to manually drive the vacuum around. Entertainment and advanced spot cleaning at its finest. Still not sure what to buy? Drop us an email. We’d be happy to help!